Youth underemployment, especially among less educated populations, has the potential to create significant social unrest and perpetuate poverty. However, little is known about how best to help youth find jobs and smooth the school-to-work transition, particularly in less developed countries. One would-be tool for expanding the labor market opportunities in these settings is vocational education, which could help students learn a trade and acquire the skills needed to take advantage of employment opportunities, and create successful small businesses. However, credible research on the economic returns to vocational schooling in poor countries remains scarce. The introduction of free primary education in Kenya in 2003 prompted a large influx of pupils previously not enrolled in school. As these pupils complete their primary schooling in the coming years, Kenya will face unprecedented numbers of primary school graduates competing for limited seats in traditional secondary schools. Vocational education is one promising avenue for these youths. Increasing vocational education has the potential to help address unemployment issues for new primary school graduates by providing students with the skills needed for employment, even without obtaining a secondary school diploma. Vocational training may also help to address the problem of underemployment among youth who exited the academic schooling system before 2003. However, there is little empirical evidence on the impacts of vocational education on employment, salary, or consumption for individuals with different characteristics and backgrounds, for instance, by gender, family background, or individual cognitive ability. 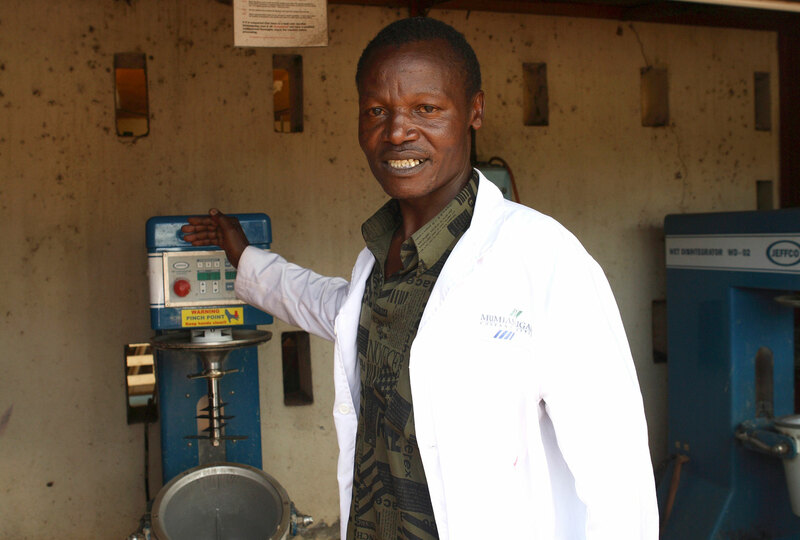 A factory worker poses in Kenya. The program was launched in 2008 with the recruitment of 2,163 out-of-school Kenyan youths (roughly 18 to 26 years old) who had participated in the Kenya Life Panel Survey. In order to be included in the sample, applicants were required to attend two meetings on the program, participate in a short survey regarding their expected returns, complete a form ranking their preferred schools and courses, and submit a letter of support from either a local official or a school official. Applicants were then entered into a lottery to determine if they would receive a vocational training voucher worth up to approximately US$325, an amount sufficient to fully, or almost fully, cover the tuition costs for most private vocational education programs and government-run rural village polytechnics. Among the voucher winners, a randomly selected half received vouchers that could be used only in government supported public vocational training institutes, while the other half received unrestricted vouchers that could be used in either public centers or in the local private vocational training sector. Once winners were informed of which type of voucher they were eligible for, these young adults were able to access the tuition voucher, greatly reducing the cost (close to zero) of vocational education. The impact evaluation tracks these individuals (both voucher winners and non-winners) over time to evaluate take-up of vocational education, and its impacts on labor market and other life outcomes. The division of the treatment group into those with restricted versus unrestricted vouchers, combined with detailed panel data collection of individuals and institutions, will allow researchers to estimate the additional labor market returns of having access to the private vocational training sector. Joan Hamory Hicks, Michael Kremer, Isaac Mbiti, and Edward Miguel. "Vocational Education Voucher Delivery and Labor Market Returns: A Randomized Evaluation Among Kenyan Youth." Working Paper, April 2011.